Is the era of the conventional combustion engine coming to an end? Right now, they make up just 1 percent of the global automobile market. But sales jumped 36 percent last year, to 750,000 worldwide, and China, the world’s largest car market, is betting big on electric. In September, Beijing announced it plans to completely ban the sale of gas and diesel vehicles at some future, unannounced date, while India, Britain, France, and other countries have set their own 2030 or 2040 deadlines. U.S. automakers are now racing to get a piece of the emerging electric market. GM and Ford have promised to roll out a combined total of more than 30 electric models by 2023. Volvo will introduce only battery-powered or hybrid new models starting in 2019. The range and speed of electric vehicles is constantly improving; when their up-front sales price finally matches a conventional car’s, “that’s when the real shift occurs,” says Colin McKerracher, head of advanced transport analysis at Bloomberg New Energy Finance. It’s partly thanks to Tesla, whose luxury Model S transformed the image of electric cars from sluggish, small, and boxy vehicles to sleek, powerful machines. One version of the Model S can go from 0 to 60 mph in 2.28 seconds—quicker than a Ferrari. But the most important factor has been the major advances in lithium-ion batteries, whose cost plunged from $1,000 per kilowatt-hour in 2010 to $300 today. As a result, automakers have been able to develop several mass-market options that, after subsidies, are less than the median U.S. car price of $34,968. Tesla has already received 400,000 preorders for its mass market Model 3, which starts at $36,200; the Chevy Bolt and Nissan Leaf start at $37,495 and $30,680, respectively. Still, “people don’t buy cars based solely on the price tag,” says Sam Ori, executive director of the University of Chicago’s Energy Policy Institute— and a number of other obstacles remain. The biggest is “range anxiety.” Car buyers still worry that an electric car could run out of battery juice during a long journey, leaving them stranded. In fact, while early electric car models needed a recharge every 100 miles or so, today’s electric cars have a range of between 200 and 330 miles—close to that of your conventional fuel tank. That covers 87 percent of an average person’s driving needs, according to one study. But consumers remain nervous. “They tend to set their requirement based on their worst-case specification,” says Sam Abuelsamid, a senior analyst at Navigant Research. Automakers also have to contend with “charging-time trauma.” Electric car drivers who choose to charge their car at home through a regular 110-volt wall plug can do so for as little as $1 for a full battery— but they will often have to wait up to 10 hours for a complete recharge. Or they can go for a “fast charge” at a public charging station. The U.S. has 43,000; China is planning to extend its 150,000 existing spots to 4.8 million by 2020. Those public charging points—many of them free—use 240-volt and 480- volt chargers that drop the re-juice time to 20 or 30 minutes. 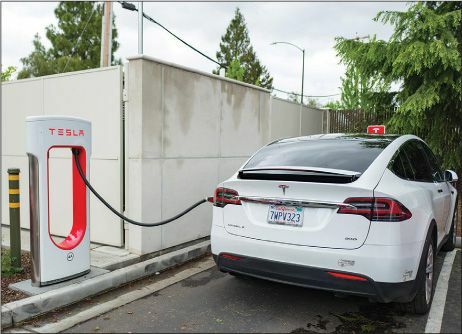 Charge times are constantly falling, and cities are pouring money into charging infrastructure, just as lawmakers have heavily subsidized the cars themselves. In the U.S., a federal rebate program gives electric vehicle buyers a $7,500 tax credit for the first 200,000 vehicles a carmaker delivers. States offer their own generous goodies on top of that— including tax credits, free parking spots, and preferential highway lanes. China and Denmark give motorists a 23 percent and 49 percent discount on electric cars, respectively. These subsidies are crucial to the survival of the electric car market; even with the plunge in prices, lithium-ion batteries still add about $20,000 to the cost of an electric car, making plug-ins unaffordable without rebates and tax credits. But electric car proponents think they have two big factors on their side: China and basic economics.